I've really got a strong -- some might say irrational -- desire for a split space bar. I want to use the right half to space and the left half to backspace, instead of reaching my pinky finger waaay up to the corner. I think every keyboard in the world should be made this way, but it seems that split space bars have never really caught on. All the split space bars that I've seen have either been teensy 40% keyboards, too small for me, or else they've been fully split keyboards, which is something else I'm not looking for. I'd like a conventional layout somewhere in the 60% to 80% range, except with a split space bar, but I'm just not sure what's the best path for me to get there. Are there PCBs or kits that support this? Or could I get components for a split keyboard and simply build them into a single case? Or do I need to look into a custom plate, custom PCBs, or even hand-wiring? Am I alone, or has anybody else done this before? I'm sure there are others that will be suggested, in the meantime hunt through the IC and GB pages and look at the supported layouts of the various custom projects. Erm. I looked at that, but every layout option I see divides the space bar into three parts, and it looks like one of my thumbs would naturally go right into the "crack" between part 1 and part 2 or between part 2 and part 3. Awkward. Not sure what the designer was thinking. That's pretty eccentric, I'll have to ponder that a bit. That looks promising. I'll research it further. Thanks! It divides it into three so that you can use standard keycaps to fill the spacebar, I think. What kind of split space do you have in mind? There aren't so many options what is feasable with the keycaps of a standard keycap set. My current project has 2 x 1.5u split space. If you are in Europe I could send you a prototype, but I don't ship overseas. The current KBDfans 75% kit on Massdrop has split-spacebar option (according to Wei through email). 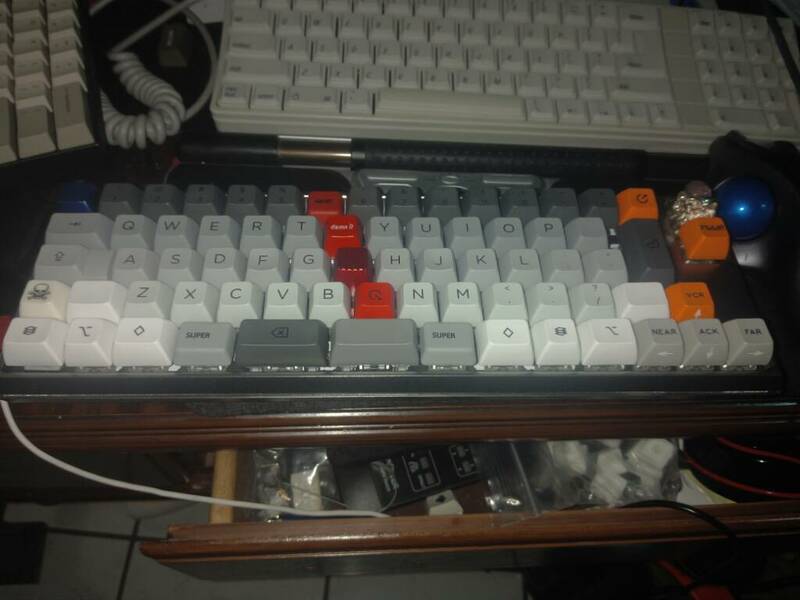 It's something I've been craving as well for my end-game layout; split/mini spacebar, ISO left-shift, attached F-row, compact layout, programmability. Keycaps can be an issue, but many full GMK sets will support these weird layouts to a degree (may need to use shift keys for space) and Signature Plastics has many options (add-on kits and blanks). Have a Banana Split coming up someday. I'm still wondering how to wire up the split space (and the 1u in between). Space backspace would be nice, then I would need to find usages for the split backspace at R1. Got me interested. Thanks for linking. Split spacebar? Check. Any love for a non-split, split keyboard? My recently re-outfitted Clueboard: I call it The Fault Line. To stay on topic, the Clueboard is awesome because you have virtually unlimited options as far as layout. Indeed, Clueboard—and Phantom—have probably the most layout options out there, at least as far as conventional form factors and staggered layouts go. Typed on my 7bit Phantom. Just had a passing thought. . . At the beginning I dismissed all those 40% or 45% teensy keyboards like the Carpe, Minivan, Vortex Core, but it occurs to me that one of those paired with a standard numeric keypad accessory might make a pretty decent combo? I remember seeing the 0.01 Z70 in Massdrop, and I think its suitable for you. It costs $160 the last time it aired. OK, that looks exactly like what I had in mind! I have placed my request. I will warn you- I got it. It's a pretty solid keyboard, and I liked it better than the whitefox because the screws were on the bottom. But I ended up returning it because the assembly service sucked. My A and L keys had to be hit hard to actuate them, and the space bar stabs sucked. I'd get it without assembly service if you can do so. It also uses USB-C, which I thought wouldn't be a big deal, but it was to me in practice. 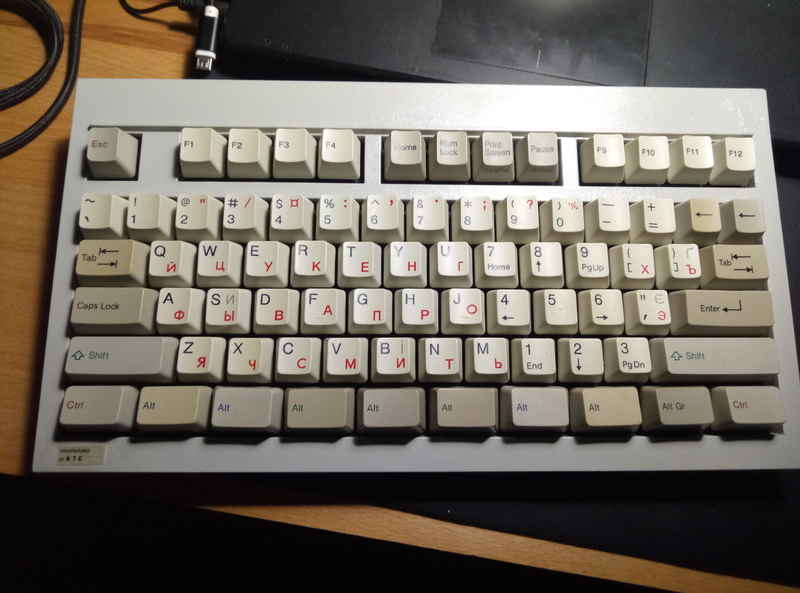 Looks similar to a Clueboard, but with an option of two 2.75x spacebars. But, but, but. . . There's a catch. It looks like the PCB supports split spacebars, but the plate it comes with does not! What the hey? So, either build it with no plate and everything PCB mounted, or have your own custom plate made? I'm almost to the point where I'd consider it. How much does it cost to have a plate water-cut? I'm also taking another look at the Banana Split. Although I dismissed it because of the extraneous key in the middle, now I'm feeling more like I should give it a try, and it might even be convenient. So, I'll be watching for whenever the next batch of those kits come out. As I've pondered what I really want in a keyboard, the things I keep coming back to are a fully programmable pcb and split space bars. So, I'm going to keep hammering away at this problem until I am satisfied. It also uses USB-C, which I thought wouldn't be a big deal, but it was to me in practice. May I ask what was the issue you experienced with USB-C? I haven't personally used a device with USB-C ports so I'm not sure what problems they can pose. It was a combination of things, and not really a fault of the standard, just adjustment and quality of life. I notice that a lot of folks seem to be using Shift keycaps on their split space bars. But... A "real" spacebar has a different shape, it's convex. You can get 3.0x true spacebars. I gather they're used in Minila keyboards, they're used on the Mistel Barocco, and replacements for those are available on eBay. 2.25x and 2.75x spacebars (as such) are a lot harder, but they do exist, I've seen photos of them. I guess they were produced for some of those funky Korean keyboards, I dunno? Somewhere out there in the world (presumably in China) there is somebody who already has the tooling to produce them. It might be an interesting exercise to track down the source of those and get a production batch. And then there's the possibility of 3D printing. 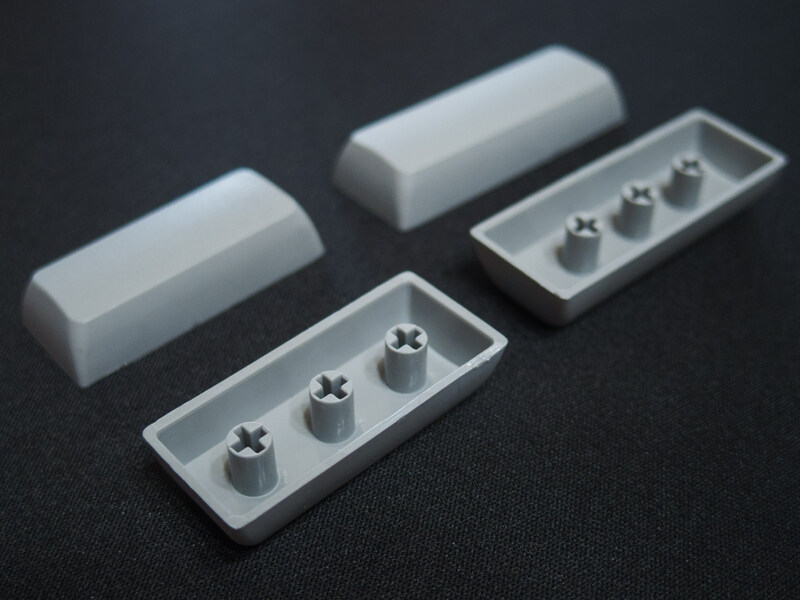 I'm skeptical about 3D printed keycaps, but I'd be wiling to hazard the experiment. Been using split space almost daily for 2+ years, having shift and enter on the 2 "spacebars" has never bothered me. As soon as you start moving towards fully custom or weird layouts you need to give up a bit of keycap/ keyset compatibility. People in the 1980s, in general, were clearly just better than we are now in every measurable way. I'm lurking for a while now, still have to introduce myself properly. With fn key between two spacebars. Very comfortable, just saying. Woohoo! Grey is fine, thanks. EDIT: It's hard to be sure from the photos, they might actually be white. It doesn't work, but that's beside the point. I've been seeing lots of split spacebar mentions over the past few days. Don't remember much of it last time I actively looked into mechanical keyboards (2-3 years ago). Is this a recent trend? Has anyone tried using blank G20 profile 2.25 and 2.75 keys as spacebars? It seems to me like they'd work pretty well since they don't really have sharp edges—the main thing that bugged me about using shift keys. And they're easy to get from SP. usually, my right thumb does nothing, it has become more useful since I put right Shift there. My board actually has 2 right Shift (another 1.75u right Shift), but there is no confusion (I just use whichever Shift key I can reach). I totally agree with you. Split spaces provide so much flexibility. I find I rarely use the other thumb if I don't have one. To add my stake to the game, I'm currently running an IC/Feedback for a 65% with a split spacebar. Link is in my sig. I own a keyboard like this. It looks wavy like the windows logo and I hated it from day one, but it does have a split space bar with the backspace on the left. It's a microsoft board but I don't remember the model. This is most likely the reason why split space bars haven't become more popular and widely used. Quote, "Erase-Eaze is a trademark of Keyboard Advancements, Inc. and is covered in US patent 5711624 filed in 1996." That patent is obvious BS that should never have been issued (and symptom of a much larger problem with the patent office). It doesn't make any sense to issue a patent every time somebody alters a keyboard layout or moves a key to a more convenient location. However, it would seem that nobody wanted to spend the truckloads of money that are required to challenge even the most ridiculous patent in court. The good news is that patents expire after 20 years. Regardless of whether it was bogus or legit, it's history now. Sculpt Comfort was what it was called. I don't recommend, I couldn't get used to the curved layout. Sculpt Ergo is an excellent keyboard for something in the mass market; the only major downside is the wireless implementation. http://www.lfkeyboards.com/lfk-tkl.html This TKL PCB has split spacebar support, but I don't know of where you can get plates. You can contact him though as I think he cuts some custom VA68 plates, he might be able to do a TKL. I used the Phantom plate w/ my builds using this PCB, but those plates don't support split iirc. This morning's mail finally brought me samples of those XDA profile mini spacebars from AliExpress. Yes, they are most definitely GRAY. You can see how the profile compares with OEM parts and with the lime green G20 keycap. You may also note they are symmetrical, so flipping them isn't even a thing. Seller says they are PBT, and they sink in a glass of water, so I guess they are PBT. If you are okay with GRAY and with waiting on the slow boat from China, these seem like the best option right now. Otherwise, I still think the G20 caps from SP would work just fine too, and either way is better than using shift keys. Reaching for backspace with my ring finger is so second nature it may be weird to use my left thumb. An advantage would be I think the space bar having less wobble and rattle and feel more solid. KPB V60 Gateron Browns and Leopold Keycaps. Poker 3 with Gateron Browns and Poker keycaps. Poker 3 with Cherry MX Browns, ABS keycaps and white LED's. Leopold FC660M- my new favorite, right out of the box. Send a message if you're interested in a trade! EDIT: The wiki says that most of them were Mac keyboards. The one I have has Windows keys. How’s the learning curve when it comes to split space bars? I feel like it would ruin my typing since I primarily use my right thumb to hit the space bar. You could always keep the right half as a spacebar and program the left half to something that you will frequently use. Personally I also primarily use my right thumb, but I still found it extremely frustrating to use a split space bar, mostly because of WHERE I hit the space bar, which depends on the last key I hit with my right hand. I suppose a better positioned split would fix my issue, but split down the middle didn't work, as I normally hit anywhere from the left or right of the center of the spacebar. Page created in 0.993 seconds with 66 queries.